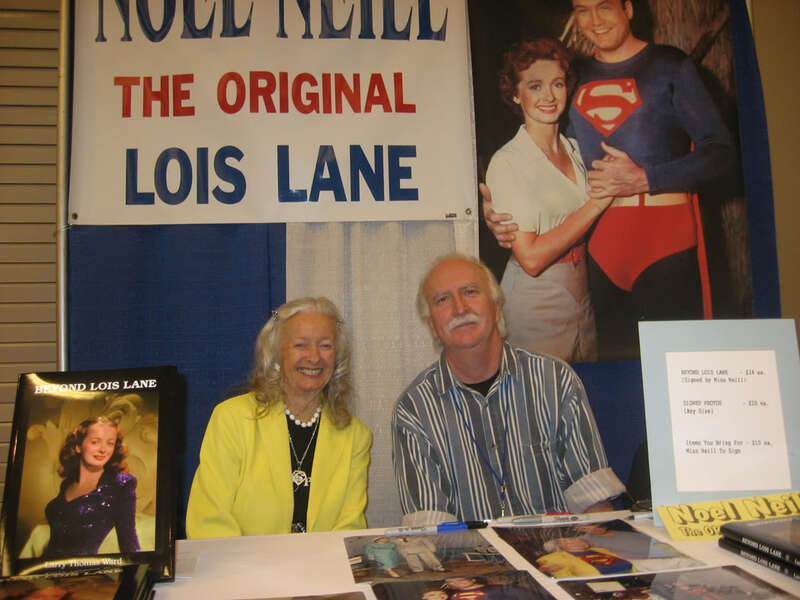 Happy Birthday, Noel Neill- The First Lady of Metropolis and Original Lois Lane! 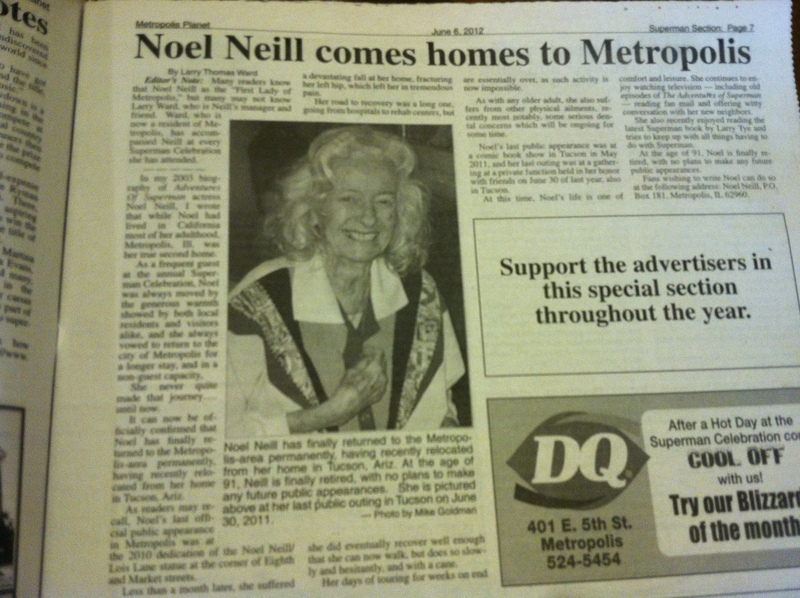 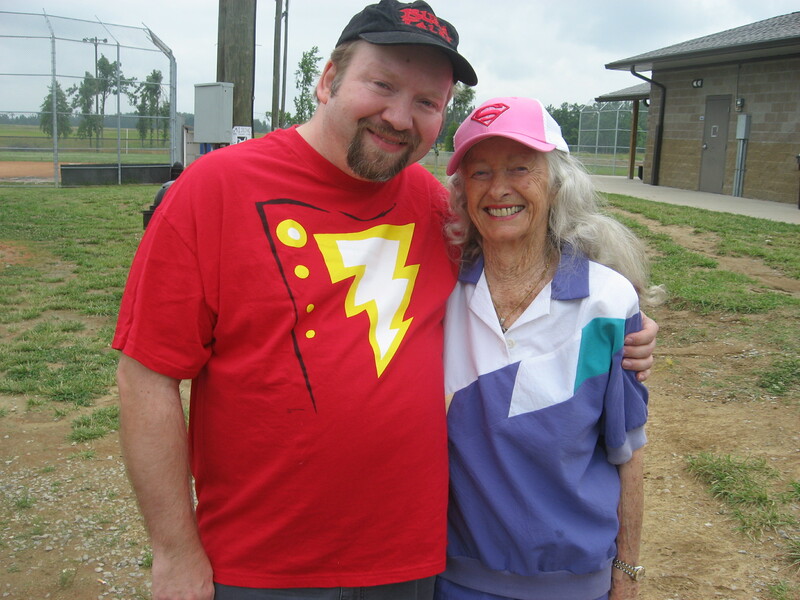 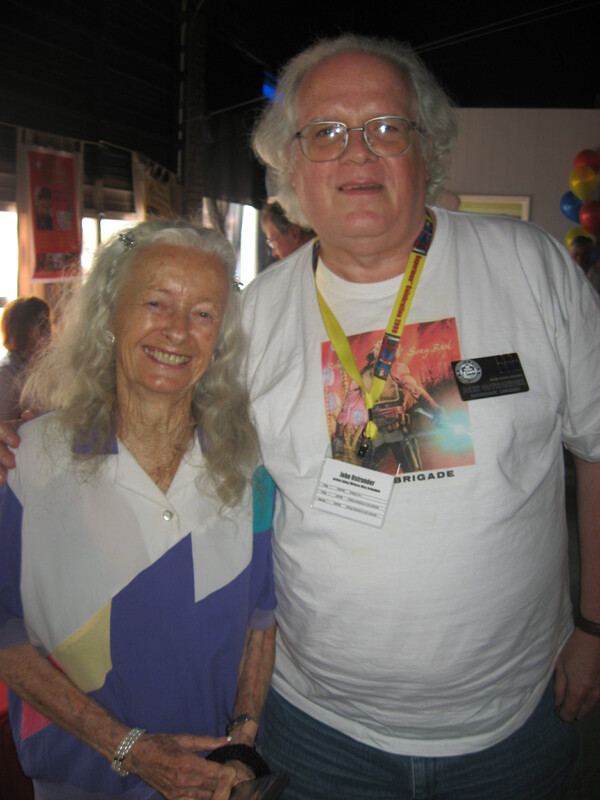 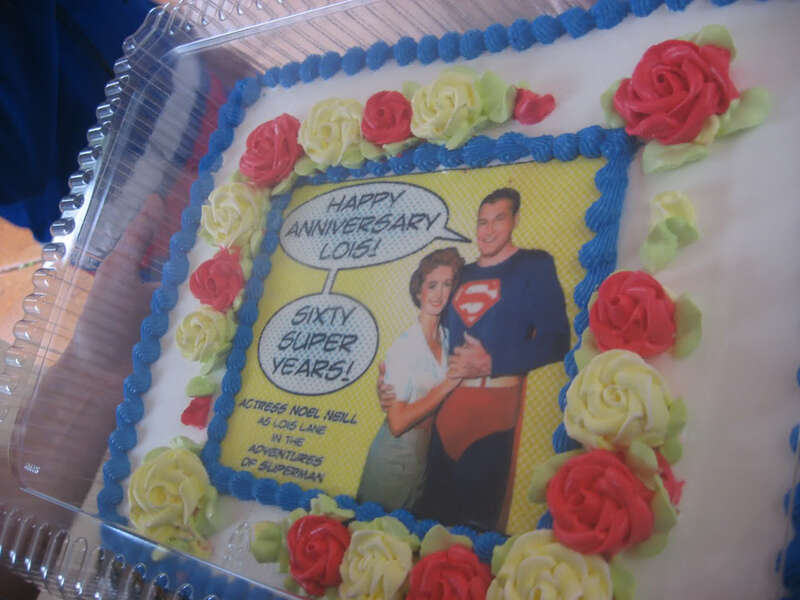 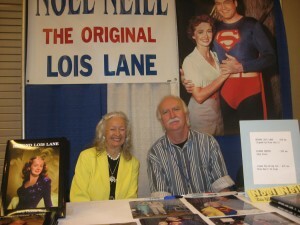 Today was the 93rd birthday for a very \S/uper lady- Noel Neill, the original Lois Lane! Noel was born on November 25, 1920. 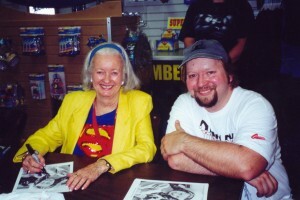 I first met her about a dozen years ago in Metropolis, IL at one of the annual Superman Celebrations. 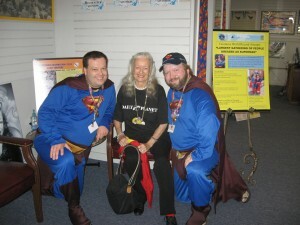 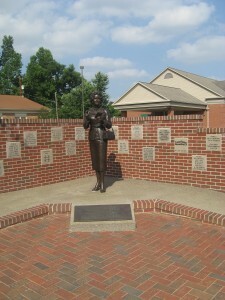 She’s been named “The First Lady Of Metropolis“, and for good reason. 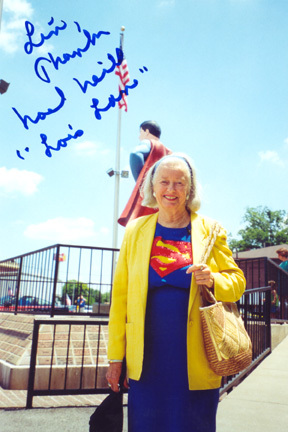 She’s been back to meet fans and sign autographs over and over, and never seems to tire of talking about her favorite Superman- George Reeves. 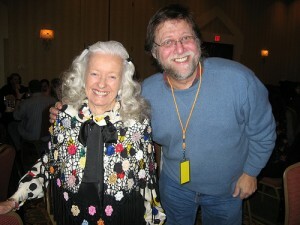 Noel has become a good friend and I always look forward to seeing her smiling face at many of the conventions I attend. 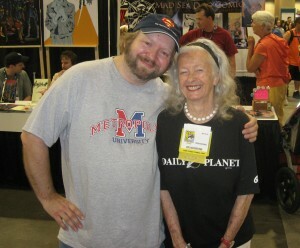 That’s us at the San Diego Comic Con when she and her manager/biographer Larry Ward stopped by my Bushi Tales booth. Here are some of my favorite pics of Noel. 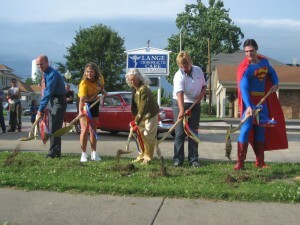 This one was taken in Metropolis just before one of the Marvels VS Meteors baseball game. 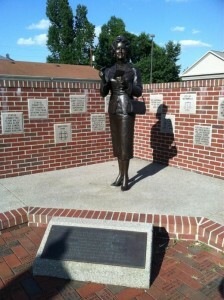 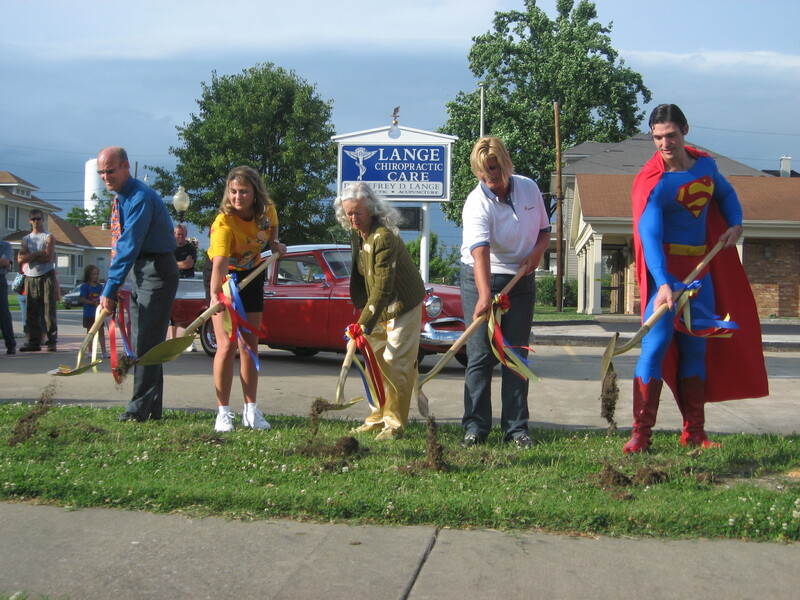 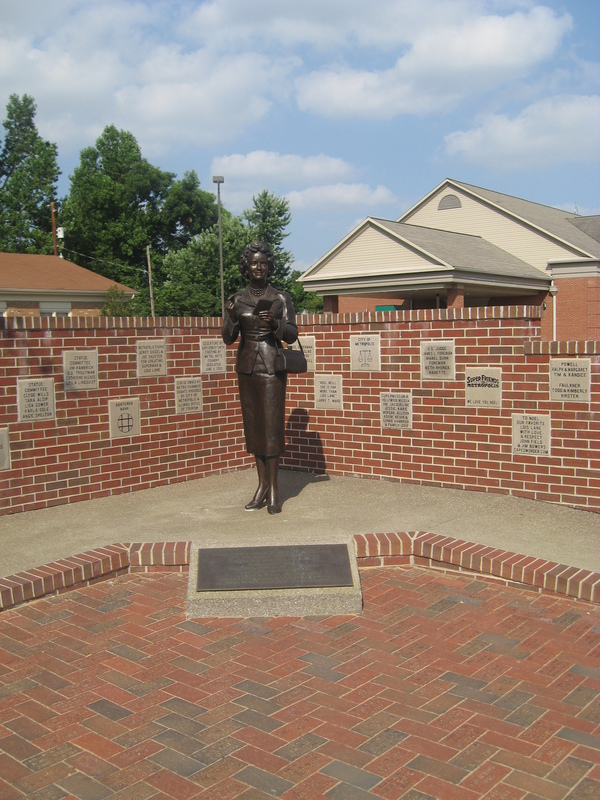 Ground breaking in Metropolis for the Noel Neill/Lois Lane statue. 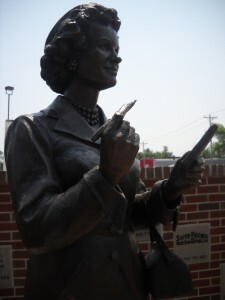 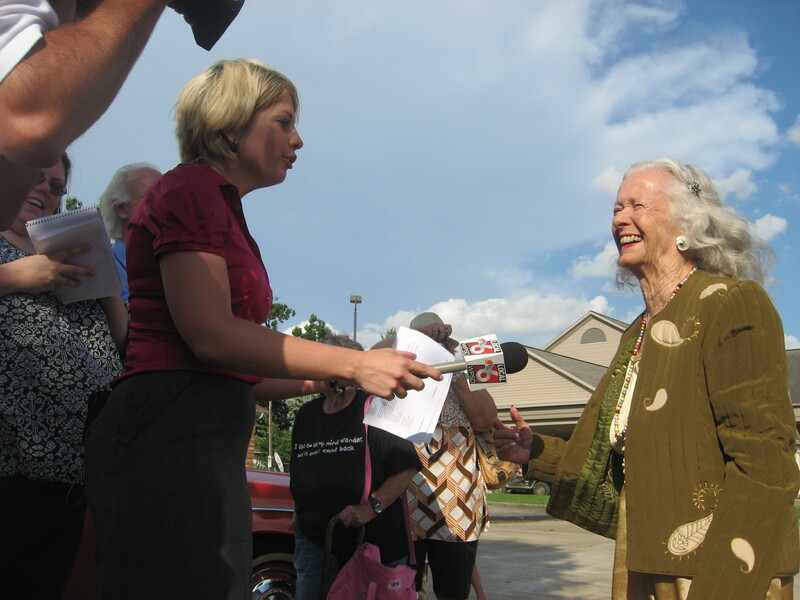 The original Lois Lane being interviewed after the statue ground breaking. 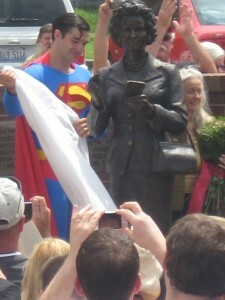 The Lois statue being unveiled by Superman and Noel. The statue stands at the corner of 8th and Market Street in Metropolis, IL- just a few blocks away from the GIANT Superman statue. 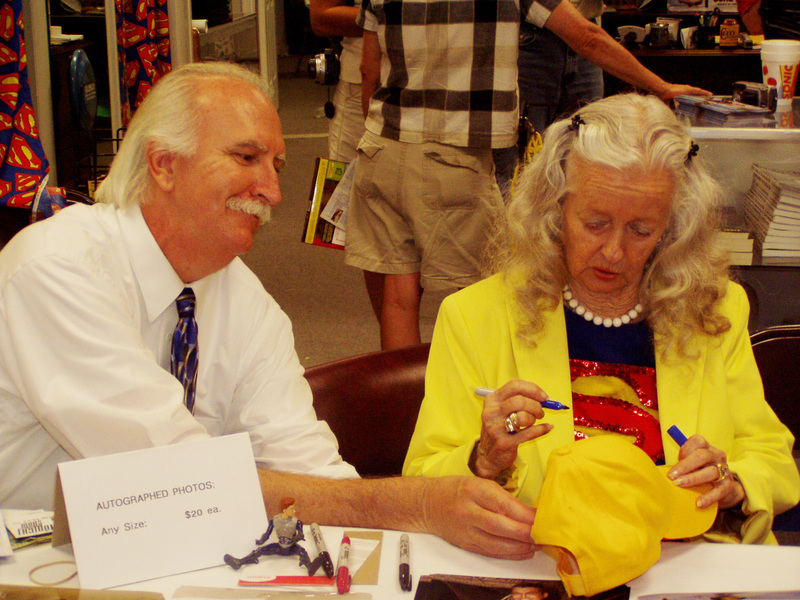 Noel getting some help from Larry Ward at a convention. 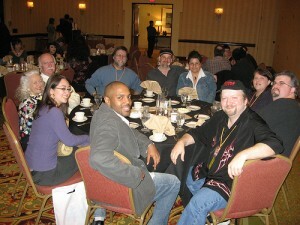 My friend Steve “Cake” Stanley and I sitting between to Lois Lanes- Margot Kidder and Noel at the 2005 Superman Celebration press mixer. 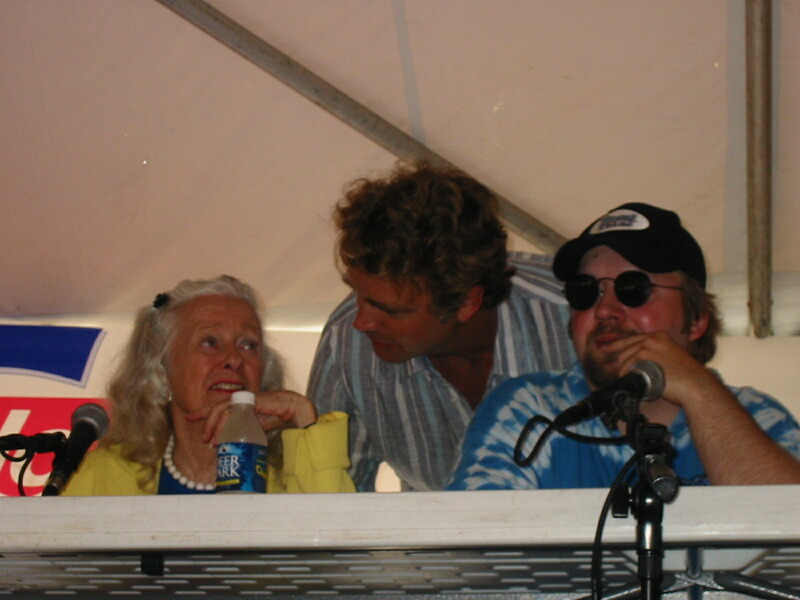 Actor John Schneider coming over to say hello to Noel during the guest Q&A panel in Metropolis. My friend Tim Brown and me with Noel at the Metropolis Chamber of Commerce. Having dinner with Noel, Larry, Len Wein, Bret and Pat Blevins, Micah Stewart, Dave Beaty, Antone and Janet Wade at the Phoenix Comic Con. Noel and Len Wein at the Phoenix Comic Con. Noel and Larry in Phoenix. Cake from the Phoenix Comic Con staff. I’ve got to find the pics of her and Lou Ferrigno with it! 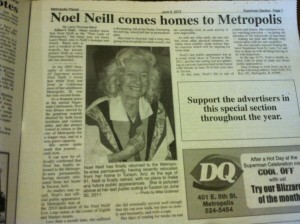 Noel was a Metropolis resident for a short time. 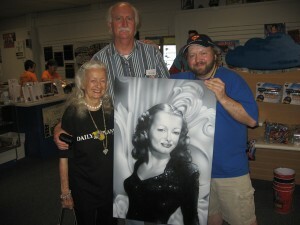 A painting I did of Noel for Larry. Superboy Gerard Christopher and Noel when she made a special surprise appearance at the Metropolis Superman Celebration last year. 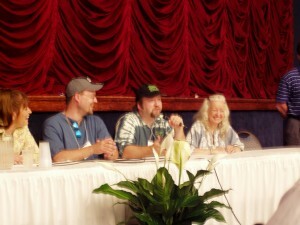 My phone erupted with text messages telling me Noel was at the Q&A! Noel and writer John Ostrander in Metropolis. It was awesome watching John become a total fanboy when he met her! 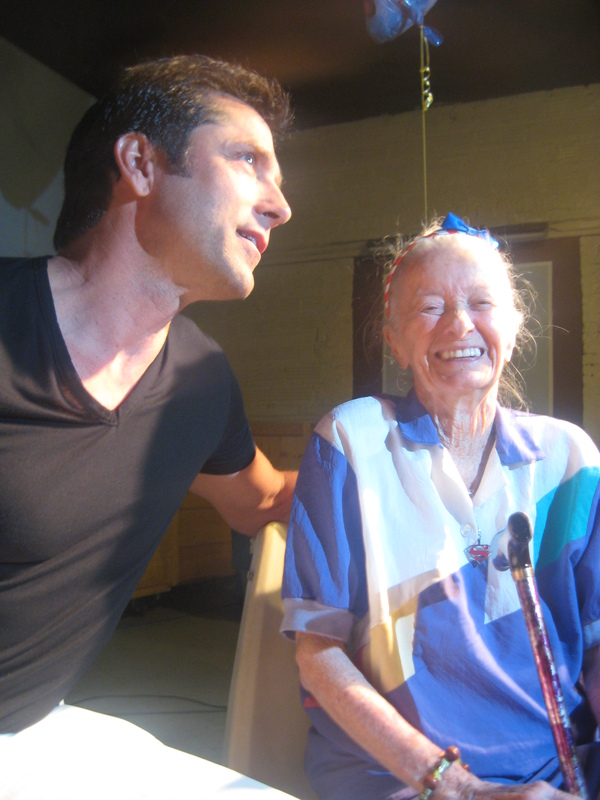 Hope you had a happy birthday, Noel- and hope you have many more!